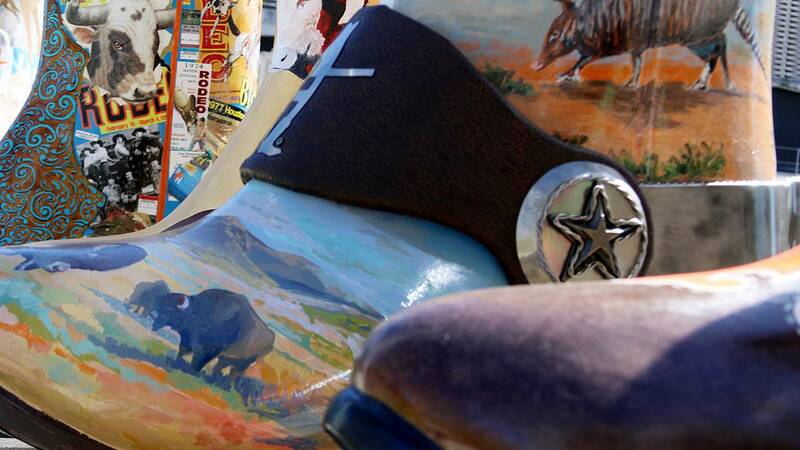 Artfully decorated boots are displayed in this image released by the Houston Rodeo on Feb. 13, 2019. HOUSTON - Organizers for this year’s Houston Livestock Show and Rodeo released a list Wednesday of the new things that fans will be able to enjoy. From more parking options to carnival rides to food vendors, there’s something new for everyone. Here’s a look at some of the things you can look forward to this year. There is a new lot and new season passes for parking for those who want to shell out some cash. The public can park at the Yellow Lot, the 610 Lot where Astroworld used to be and the OST Lot north of NRG Park. There’s a new North Stadium Lot between NRG and the OST Lot. Parking at the OST Lot will run you $15, while parking at the Yellow Lot and 610 Lot will cost $20. You’ll pay $25 to park at the North Stadium Lot, or you can buy a season pass for $525. For more parking information, go to RodeoHouston.com. The Action Seats have been upgraded this year to be more comfortable. They include more leg room and a cup holder for each fan. For the big spenders, there’s the VIP Champions Club. These tickets cost $175 and include admission to both the stadium and the park, upscale food, an open bar, viewing of the rodeo and concert from the club on TVs or from the level one concourse. Stadium seating is not included. Go to RodeoHouston.com for more ticketing information. You’ll find this 22-foot by 36-foot display of interactive video screens between NRG Stadium and the Astrodome. In addition to general information, you can use the interactive mirror to create fun pictures using filters and augmented reality. Ten artists who were picked from entries submitted in September will have their works displayed on 6-foot, 3-D fiberglass boot statues. These will be on display from Feb. 25 to March 17. There are five new carnival rides coming to this year’s Rodeo. Here’s a description of each ride, provided by RODEOHOUSTON. Astroliner Looping Coaster – The Astroliner looping coaster, the only fully portable looping coaster in the U.S., has 360 meters of track with amazing twists turns and an over-the-top loop. Happy Train – The Happy Train is suitable for adults and children to ride and enjoy together. Take a train adventure and enjoy the Happy Train. Ice Jet – The Ice Jet is an extremely fast family thrill ride that rotates in a circular motion, in forward and reverse direction. Ice Jet is themed like a runaway toboggan with spectacular energy efficient lighting and decoration. Tea Cups – Take a spin on the new version of the Tea Cups and control your ride — you can spin as fast or as slow as you wish. Suitable for all the family to participate together. Titan – Titan is the tallest portable thrill ride in the United States, weighing in at more than 200,000 pounds! Riders reach 17 stories high and speeds at more than 60 miles per hour. There are even more things that are new this year. Go to RodeoHouston.com to see them all.